IBM Corp. profit rose in the third quarter on Wednesday afternoon, but the stock took a hit as the high-tech giant posted another decline in revenue. IBM shares were down 6% after hours after the company reported a third-quarter profit of $4.04 billion, or $3.68 a share, compared with a profit of $3.8 billion, or $3.33 a share, for the year-earlier period. Adjusted profit was $3.99 a share. Revenue was $23.7 billion, down from $24.7 billion. Analysts polled by FactSet on average were expecting IBM to report a profit of $3.96 a share, on revenue of $24.79 billion. IBM has missed Wall Street’s revenue forecast in seven of the past eight reported quarters, according to FactSet. “Not often that somebody misses by a billion,” ISI Group analyst Brian Marshall told MarketWatch. The company said it was maintaining its full-year adjusted earnings outlook of at least $16.90 a share. Analysts were expecting a full-year earnings of $16.87 a share. IBM said revenue from its growth markets fell 9%. IBM said sales in the so-called BRIC countries, including Brazil, Russia, India and China, declined by 15%. In a call with analysts, IBM pointedly specifically to problems in China where the company said it’s been affected by economic reforms and broader execution problems. IBM’s software business posted revenue of $5.8 billion, up 1% year-over-year. But its systems and technology segment, which covers hardware, recorded sales of $3.2 billion, was down 17%. The company’s IT services unit saw sales fall 4% to $9.5 billion. IBM Corp. was downgraded to a neutral rating at UBS on Thursday morning, following disappointing third-quarter results from the previous afternoon. 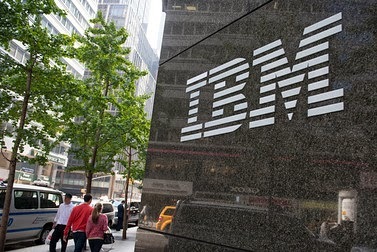 In a note to clients, analyst Steven Milunovich wrote that "IBM has badly missed not just revenue but profit two of the last three quarters, which is unusual." The company's reported EPS number met consensus targets, but Milunovich noted that a lower tax rate contributed about 40 cents to that figure. "The poor near-term results and questions raised about farther out earnings power can't be ignored," he wrote. "Normally we would wait out mediocre results in preparation for the bounce back, but there are too many questions this time." He also cut his price target on the stock to $186 from $235. The shares were last trading down 6% to $175.41.